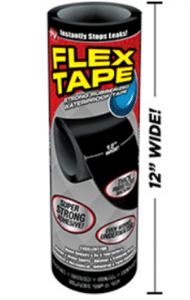 Flex Tape Review – A quick leak free repair? Does Flex Tape Really Work? Almost everyone at some point in time has had a need to repair some type of leak. It may have been a water leak or an air leak. When it comes to water leaks then they can be a real challenge to not only repair but to ensure that the repair works. Now in the past ,we have talked about some well known products to help prevent leaks like Flex Seal, so does the latest offering for this type of product work even better which is Flex Tape? Flex Tape comes in three handy sizes. It is supposed to be super easy to use. You just cut the size of the piece you need and stick it over the leak. The promoters of Flex Tape are making some pretty bold claims. They are saying that Flex Tape works in almost every situation where a leak needs to be fixed. They even show it being used in a fish tank that is still filled with water. Then for those that saw the advertisement on TV it shows a boat being cut in half then joined together with Flex Tape. With no leaks being evident when the boat was tested in the water. If Flex Tape really lives up to all that it is touted as being able to do, then it really revolutionizes the way that leaks can be addressed. The real bonus is being able to fix pools, spas and yes even fish tanks without having to drain the water. For those who are not very handy having a quick fix like this is going to be super beneficial. 12” x 10′ $49.99. To these prices, you need to add the shipping costs of $9.99 shipping PLUS $9.99 processing. Included in your order you will have a choice of a tin of Flex Seal or Flex Shot or a can of Flex Seal Liquid. It looks like it is not going to take too much of an effort to use the Flex Tape. It will just be a matter of identifying the leak then applying the tape. When some of the other flex products hit the market there was a lot of fuss made over them as they were heavily marketed. One concern is, have they flood the market with these other Flex products so they are just taking a new approach. Or, is Flex Tape a step up in improvements over the other products. Meaning that its a much easier process to apply the tape rather than go through the steps needed for the other products. The Flex Tape is still so new on the market that it hasn’t really gotten any feedback as yet. We are leaning towards giving the Flex Tape a strong Try/Buy. The feedback on the other Flex products are mixed, with more seeming to like than not. For those who don’t have a handy person around the house to fix a leak, then have a roll of Flex Tape on hand may be really beneficial. One thing that is not impressive is the cost of the product is rather hefty but even more so when you add the shipping cost on. THEN the processing fees. This really does take the price way up to the point where maybe the question should be asked is it really worth it. Before making your final decision about Flex Tape maybe you want to check out the review of Flex Seal. What do you think? Does the Flex Tape work or not? Does the Triple Play Sprinkler Really Work? Haven’t tried it, but giving only a 2 because the boat you see on the water is not the same as the one we see him cut in half. Look at the seat’s distance to back of boat! Also, I worry for those who don’t read all the small print. With the hole in the the roof, they say it “comes n a wide size…” and they show it so. That’s what they say about the $19.95 roll, too, but it’s only 4″ wide! Gotta wonder why they can’t be real! Don’t waste your money on the Flex Tape. IT DOES NOT WORK. We tried to fix a small spit in the seat of our side by side and it will not stick to it. Noticed that level of water in the large tank does not go down even though a large amount of water is pouring out before he puts the tape on. Hmmmmm?. Did not work on tiny little holes in my above ground pool. Don’t buy it. i have a rip in my pool liner once the water pressure got to it . the flex tape tor open tried 3 times. I was determined because it fixed a hole on the other side of the pool and it is holding up. not sure if this can repair this hole because of where it is located in the pool. I agree with others here. A crap product. Peels immediately. This tape is GARBAGE!!! It couldn’t seal a tiny hole on the inside of my vinyl pool it slipped right off after 3 tries!Total and complete WASTE of money!!! Horrible stuff. Not only expensive but is NOT waterproof and does not adhere to anything moist let alone wet. I agree it’s crap. Wont let me leave only 1 star above. Goes automatically to 2.75. More crap. 1 star is even too many. This stuff is a rich man’s gold mine, and a poor man’s worst fear. Tried it over and over again, did not stop a simple little pin hole in a pipe. Cleaned and dried the area with alcohol, needless to say it does not hold up. The video salesman is a crook, and the puppet of the maker of this junk. I didn’t see anything giving a full refund, to ALL unhappy and dis-satisfied customers. Fooled me once, can’t get me twice. I vote 1 star. It records 2 stars. Even this rating site is bogus. It ruined the item I put it on. It kept slipping and leaves an impossible to remove adhesive. I had to recover my item.